THERE IS NOTHING BETTER than being able to relax on the perfect patio furniture with a nice cup of coffee first thing in the morning. The sun is shining, there's a beautiful cool breeze blowing, and the world is just starting to wake up. Sounds good so far, right? But, how do you know if you are buying the right patio furniture? Do you just go by looks, comfort, materials, expected life expectancy? Since choosing the right patio furniture is just as important as choosing the materials you built your deck from, to a certain degree, all of these should and will play a part in your final decision. To make things a little easier for you in your search for the right patio furniture to turn that empty deck and patio from an empty and hostile spot into a warm, comfortable place to enjoy a family meal in the late evening as it cools down. When buying patio furniture, your choice of materials sets the look of your entire patio. While you are shopping for furniture, you need to not only look for furniture that is pleasing to the eye but is also comfortable. Who wants to have patio furniture that looks amazing but is about as comfortable as sitting on a brick? Those who love the natural look tend to be more interested in wood furniture. If you are going to invest in wood patio furniture, look for furniture that is made from center-cut hardwood that has a consistent grain. Also look for furniture that uses stainless-steel or zinc-plated. Not only will this help reduce corrosion, but with a simple wrench, you can keep your furniture nice and tight. So, all of this being said, let's look at the four most popular types of wood used to make outdoor furniture. Both cedar and pressure-treated pine are very popular and perfect if you plan to hang on to your patio furniture for any number of years. If you are trying to work on a tight budget, I recommend you go for the pressure treated pine as it is typically significantly less than cedar. However, both of these woods age similarly, turning silver or gray. You can preserve their color by sealing the wood annually. Teak is an expensive tropical wood that is typically quite expensive. However, if you want wood outdoor patio furniture that is going to last, teak is the way to go. Even under the harshest of weather conditions, you can expect to get 50 years out of furniture made from teak. You can let it age naturally or use teak oil twice a year to keep its natural beauty and preserve it for a longer life (Your grandkids could inherit your patio furniture). For the most part, natural wood patio furniture is made from tree branches that have been rough-cut. This type of furniture has a couple of major drawbacks. The first is the being made from branches instead of the trunk, this furniture tends to be very flimsy in nature, with a very short lifespan. The second is that it doesn't do very well under harsh weather conditions. While you can seal using something like Thompson's® Water Seal, doing this can cause it to lose its natural rustic charm. If you just “have to have” this furniture, it is best kept in a sun room or under the roof of a covered porch. Jarrah is native to Australia is another sturdy wood, similar in strength and durability teak. It has a very similar reddish color that makes it ideal for your patio. Like teak, there are specific treatments available to help it retain its natural color. 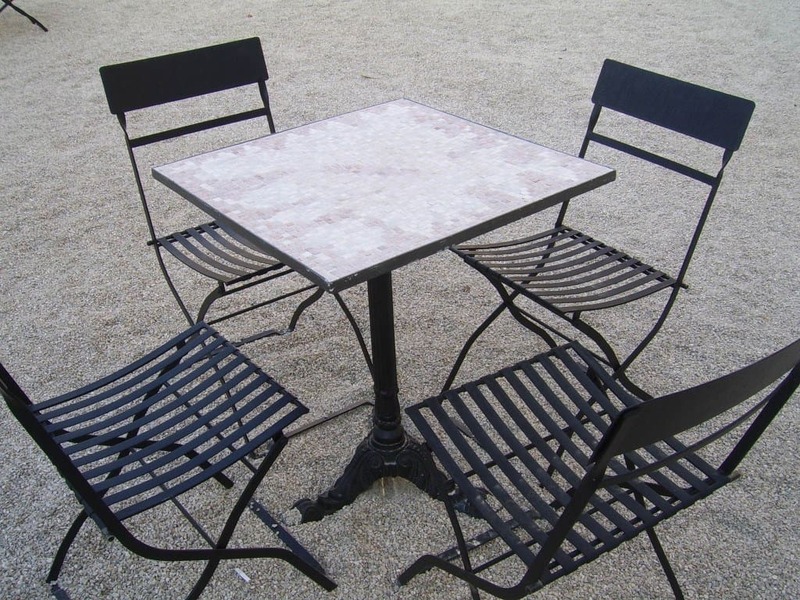 Metal patio furniture offers a sturdy look that so many people love. Metal furniture made from aluminum, cast iron or steel (if you want a retro-painted look) can provide you with versatility, comfort, and of course durability. If you are in the market for something a little less flimsy than extruded aluminum, but without the weight of cast iron, this is the way to go. With cast aluminum patio furniture, you can enjoy all of the ornate décor you might find with cast iron, but in a material that will not rust or corrode. You can expect to pay more for this type of aluminum furniture, but you might find the extra cost well-worth it. The looks of today's cast iron can be traced all the way back to the Victorian era with every swirl and twist. The heavy weight of cast iron is ideal for those who live in windy areas (cast iron is pretty hard to carry let alone be blown around by the wind. The more complex the design, the more elegant it might look on your patio or deck. The drawbacks, it is heavy and hard to move around, and it can be very hard to sit on, so cushions are almost a must. Typical colors are black, white, or green. You will need an anti-rust oil treatment to keep it from rusting. If you are trying to give your patio that bygone era look, then retro-metal may be just what you are looking for. Some brands come with beautiful artwork on the backs of the chairs, others come in a wide array of corrosion proof colors. However, you should plan to add some form of colorful padding or cushioning to make the seats more comfortable and to make sure you don't scorch your bum during the hot summer days. Wicker has long been one of the most popular forms of patio furniture. It comes in two styles, natural wicker and “all-weather.” While they look very similar to each other, they differ significantly in lifespan and the amount of maintenance needed to keep it in good shape. All-weather furniture requires little more than a good wash down with a hose from time to time. Whereas natural wicker must be cleaned properly and then treated with the proper wicker oils to keep it from molding or dry rotting. Traditional wicker furniture can be made with Rattan vines, bamboo, or cane. Because wicker is a natural material, it is best suited for use under cover porches or patios. You should avoid using natural wicker furniture when it is wet as this can cause the individual strands to stretch. If the wicker is painted, you can keep it looking good by simply adding a fresh coat of paint as needed. This type of furniture is made from synthetic fibers that are twisted into sheets of wicker mounted on steel or aluminum frames. While it will fade over time, synthetic wicker will last for many years, even in harsh summer weather (you should store it out of the snow and ice). You can buy all-weather wicker furniture in an incredible array of styles and colors to match your décor and tastes. Plastic/resin furniture has a few things going for it such as it's inexpensive with lots of styles and colors to choose from. But, like most other types of outdoor patio furniture, it's not without its own set of drawbacks. Most designs are very simplistic to keep the cost down, everything looks like a clone. The pieces are very lightweight and generally do not hold up well in harsh weather conditions. Now that you have a pretty good idea of the different materials used to make outdoor patio furniture and their good and bad points, let's take a look at what you should be doing before you spend a dime on your first piece. 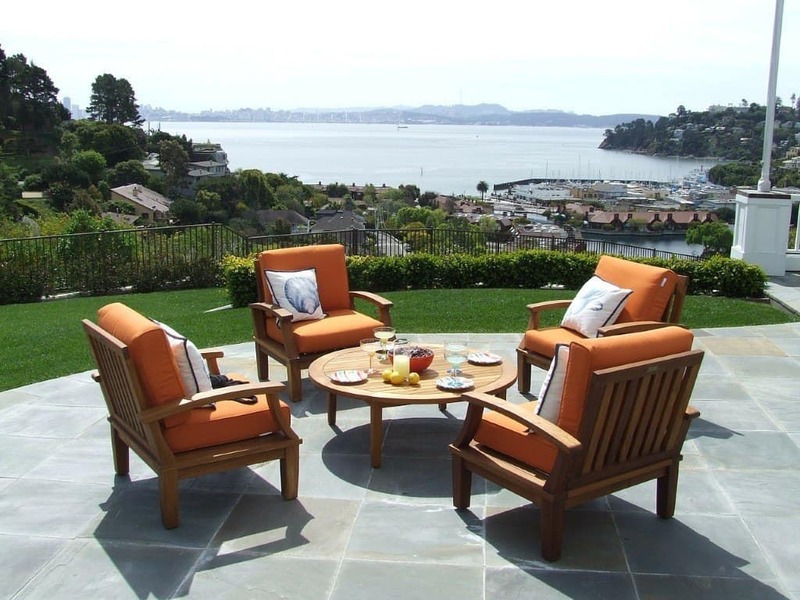 How You Plan to Enjoy Your Outdoor Patio Furniture? How you plan to use your furniture can make a huge difference in what you buy. For example, if you plan to lounge around in the shade on a hot summer day, a chaise lounge might be worth looking into. 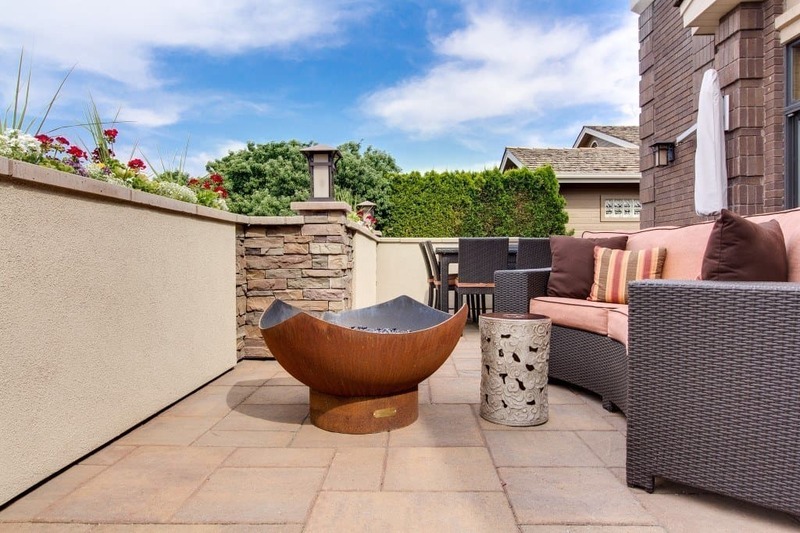 Do you plan to add a fire pit for family gatherings, a set of comfy chairs and maybe a love seat might be a better choice? Think very carefully about your projected use and then move on to the next step in the buying process. Color should be the next thing you think about as you are the only one who truly knows what you have in mind regarding the final result you are trying to achieve. Basic white, natural wood, black, you name it and you can find it out there somewhere. Spend some time looking online and in brick and mortar stores looking at the different types and styles out there. Sit in as many of them as you can. Heck, take pictures of the ones you like the most and take them home with you. Hold them in front of you and place the picture in the right spot. It's a good way to get a rough idea of how each type of furniture would look. While you might feel the need to “insta-buy”, this is never the way to buy anything. It has never been more important than when you are buying furniture for your patio. Look for similar items on sale or at lower prices. Take your time and make sure you are getting the best possible deal on your new patio furniture. While you may pay more for quality furniture, you will find the investment more than pays for itself. Measure the size of the area you have to work with. This will help ensure you don't end up with patio furniture that is too big for the space. Decide on the style of patio furniture you want. The style you choose will set the tone for the rest of your patio. Do you want a to create a vintage look, a bistro, or something with a little more rustic charm? Consider looking for discount or sale furniture. If you are patient, you may find exactly what you are looking for at a great low price. Look for and if you can test any furniture you are considering for durability and most importantly for a manufacturer's warranty. If possibly take each piece of furniture for a test drive. The last thing you want is to end up buying uncomfortable furniture, no one is going to want to sit in. If possible, try to protect your new patio furniture from the sun's UV rays with an awning, pergola, or even an umbrella. When buying cushions, be sure they are mold, mildew, and water resistant. Be sure the patio furniture you buy has the right weather resistance protection to prevent rot and rust. Be sure you understand both delivery and assembly requirements to avoid surprises when your new furniture arrives. Finally, double check that the furniture you are about to order is going to be the right fit for your home. The functionality of your porch will depend highly on your choice of patio furniture. A few extra days of short-term thought beats years of long-term regret. It can't be said enough that you need to take your time deciding on the type of patio furniture is going to be the best possible choice for your patio and your family. Keep in mind that you will be using the same furniture for many years to come. It pays to do your homework and make the right decision. I hope that the information I have put together here for you helps you find the right furniture for your patio and that you and your family enjoy many lovely evenings together.